One of the aims of the Sherborne Abbey Festival is to foster a love of music in young people. To this end, a Saturday morning workshop is a regular event at the Festival, when workshop attendees spend the morning working with professional musicians, culminating in a joint performance. This year’s workshop features Dorset dance tunes. Dorset has a rich tradition of instrumental dance music stretching back to the eighteenth century. The music is very melodic, accessible and fun! 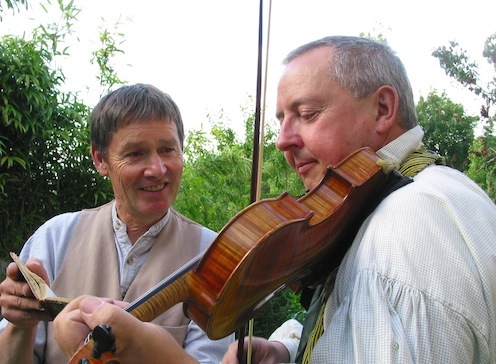 Tim and Colin will take you through some of the wonderful jigs, hornpipes, waltzes and polkas from the manuscripts of Benjamin Rose and Thomas Hardy. The tunes we will be exploring in the workshop come from two local collections: some were written in a small manuscript book in 1820 by Benjamin Rose, a farmer, alehouse keeper and fiddle player from Belchalwell near Okeford Fitzpaine in North Dorset. The other tunes come from the manuscript books inherited by Thomas Hardy from his father and grandfather, who played in the Dorchester area. The workshop will be mostly playing, but we will also talk about the life and times of country musicians, to give the tunes a social context. The workshop is open to anyone over the age of eight, on any acoustic instrument. The ability to read a simple melody or bass line is needed. We will also provide very simple inner parts, so we can accommodate beginners who can only play a few notes. The keys we will be using will mostly be G, D and C. We will provide Bb parts. If anyone wants to join in with other transposing instruments, please let us know so that we can make up the necessary parts. Participants are welcome to take away the music for their own use at the end of the morning. TIM LAYCOCK is a folk musician and actor with a particular interest in the works of Thomas Hardy and William Barnes. Tim performs in the Hardy country properties through the summer months, and is also Artistic Director of the New Hardy Players. In July 2018 Tim will direct The Trumpet Major for outdoor performances in Dorset, including the 50th Thomas Hardy Society Festival and Conference. Tim has worked at the National Theatre and at the RSC, and was recently folk music consultant on the BBC drama The Living and the Dead. COLIN THOMPSON is regarded as one of the finest exponents of the English style of folk fiddle playing in the country. He is also an accomplished guitarist and recorder player and performs with the Casterbridge Band for country dancing. Colin also plays for Historical Dance at Barrington Court. Colin and Tim have recently released Any Little Old Song Will Do, a new CD recording of songs, poems and music recorded in Hardy’s Cottage.